The Pretenders were a studio project from the mind of Paul Buff, also of the Hollywood Persuaders. 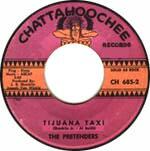 The legendary east LA label Chattahoochee issued this in '65. It's a mariachi based Tijuana Brass sorta thing. This is a Tijuana Brass-like mariachi based melodic track, with car horns and a Mexican driver shouting "hey señor, Tijuana taxi?" A joyous single, leaning farther from surf than Bob Moore's "Mexico," but still related in time and appeal. "Pepita's Theme" is so much more MOR than the A-side, and is not of the mariachi sound at all. This slow last dance song sports a pretty melody and very nice guitar, thought it's way too low in the mix. Still, it's an enjoyable track.